GALA held their annual event in Amsterdam this year, and U.S. Translation Company was proud to be a featured presenter. 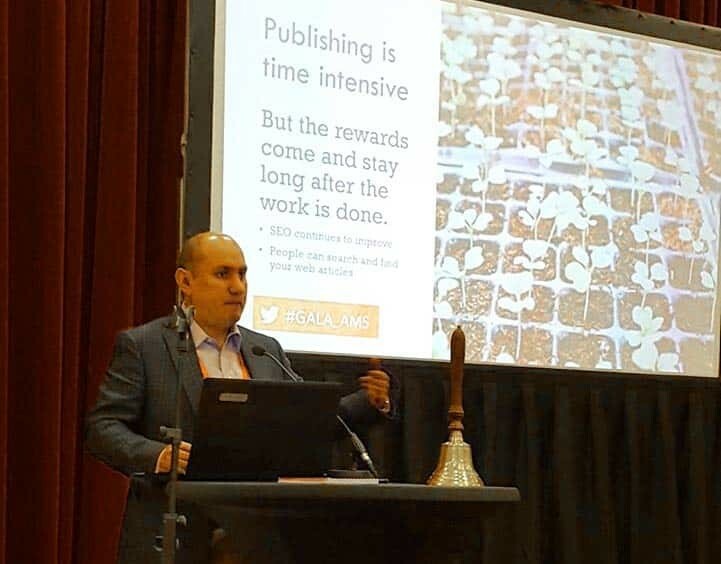 Our CEO, David Utrilla, discussed the value of industry research and industry publication as a differentiator in a competitive language services landscape. Indeed, clients in the life sciences, manufacturing, scientific, and other fields have come to expect a certain familiarity with their industry on the part of an LSP. Many if not most translation and interpretation firms claim expertise in the aerospace sector, in medical device translation, in pharma, or in any number of other fields. It’s not enough to make the claim; an LSP needs to demonstrate said expertise. Problematically, there aren’t a lot of ways to do so. Enter publishing: by writing about your knowledge and getting that knowledge broadcast through industry outlets, you begin to build your online reputation for knowledge. At GALA, David presented a step-by-step plan for expert content marketing. He shared U.S. Translation Company’s own system for building an expert reputation within specific industry verticals—a system that USTC has used to great effect. The audience, consisting of other LSP executives mixed with industry localization folks, gave David a great deal of positive feedback. A common theme seemed to be that LSPs realized that they needed to invest in content marketing, yet hadn’t till that point known how to do so. David Utrilla participates in executive round table discussions at GALA 2017. GALA also includes executive round table sessions at their annual event, and this year was no different. David enjoyed contributing his knowledge on translation, interpretation, the state of the industry, etc. He also learned a great deal from other executives and returned home to Salt Lake City full of new ideas.